Purpose: Sharing of risk benefits supplies network collaborations. The complex mix of heterogeneous collaborators in supply networks, however, also increases the complexity of the risk profiles of inter-related components within these networks. For a given network collaboration, several structures of network relationship are possible, with each carrying distinctive risk implications. This paper seeks to develop a conceptual framework for analysing the differential risks in alternative network structures. Design/methodology/approach: To capture the structural significance of inter-organisational dependency in networks, alternative typology of network relationships is formulated using agency theory. 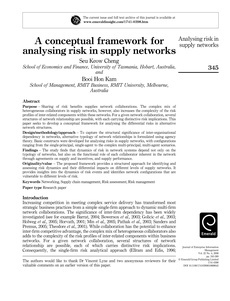 Basic constructs were developed for analysing risks in supply networks, with configurations ranging from the single-principal, single-agent to the complex multi-principal, multi-agent scenarios. Findings: The study finds that dynamics of risk in network systems depend not only on the typology of networks, but also on the functional role of each collaborator inherent in the network through agreements on supply and incentives, and supply performance. Originality/value: The proposed framework provides a structured approach for identifying and assessing risk dynamics and their differential impacts on different levels of supply networks. It provides insights into the dynamics of risk events and identifies network configurations that are vulnerable to different levels of risk.